She's now the longest-reigning monarch in British history and the longest-reigning female monarch of all time. Because we're witnessing that important historical milestone this week, there's been lots of discussion of Queen Elizabeth II's legacy. This gorgeous diamond and sapphire brooch was one of the wedding gifts received by the Queen in 1947, given to her by the company that made it, Carrington. The lovely natural feather design of the piece is both delicate and substantial, and the sapphire stone pairs well with lots of different colors. As long as there is a Queen of Australia, there will be an important role for this beautiful brooch, made of white and yellow diamonds set in platinum. The piece was made in Melbourne by William Drummond in 1954 and presented to the Queen during her Commonwealth Tour in Canberra the same year. It will obviously be useful for wear in Australia in the future, but its design lends it well to everyday use, too. Part of a suite that was the Queen's wedding gift from the Nizam of Hyderabad, this Cartier-made necklace is a glittering marvel in diamonds and platinum. Especially suited for evening wear, the necklace has already been loaned out once to a future queen consort, the Duchess of Cambridge. And the piece is versatile, too -- the double-drop pendant is detachable. Classic, traditional, and still sharp and interesting, this brooch was left to the Queen in the 1980s by Lady Jardine. She's worn the diamond brooch frequently ever since, and it's easy to see why. The piece not only coordinates well with daywear but is also perfectly suited to secure the sash of an order for a state banquet. One of the many jewelry gifts the Queen has received from the Saudi royals, this necklace was a present from King Khalid of Saudi Arabia in 1979. The piece looks extremely traditional, but it's actually modern, commissioned by the Saudis from Harry Winston in the late 1970s. It's looked beautiful so far on both of its wearers: the Queen and the late Diana, Princess of Wales. Once thought to be from the collection of Josephine de Beauharnais, this diamond and emerald necklace was left to the Queen by the Godman sisters in the 1960s. Even without a French imperial provenance, it is absolutely stunning, with the kind of presence that suggests it's meant to be worn by a queen. 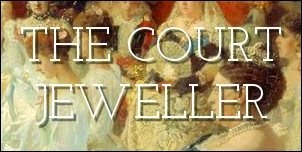 In 1950, King George VI instructed Garrard to construct a necklace for his daughter, then Princess Elizabeth, out of 105 loose collet stones in the royal vaults. The result was this gorgeous diamond festoon necklace, which features distinctive triangular motifs on each side. The piece has become one of the workhorses of the Queen's evening collection, and it's easy to see why: it has more visual interest than your average collet necklace, but it's also simple to coordinate with other jewels. George VI was also the source of the lovely Victorian-era sapphire suite in the Queen's jewelry box. He gave her the necklace and earrings, and she later supplemented the set with a bracelet and (less successfully) a converted tiara. The necklace is especially lovely, and an important addition to a collection that had lost its major sapphires (the Cambridges) a generation earlier. The tiara from this parure is an especially controversial one, but the size and quality of the aquamarines makes the set one of the most important additions to the royal collection over the past half century. The set was a gift from the people of Brazil (in various stages), and the Queen herself had the tiara made by Garrard. The necklace, earrings, and bracelet are particularly lovely, and the tiara has fabulous stones that would be great candidates for another tiara designed by a future queen! Queen Victoria brought the Koh-i-Noor Diamond into the royal collection; King Edward VII brought the Cullinan Diamond; and Queen Elizabeth II has contributed the Williamson Diamond, the finest pink diamond ever discovered. The diamond was given by Dr. John Williamson (its discoverer) to the Queen as a wedding present, and she had Cartier set it in the center of this delicate floral brooch. She usually saves it for important day events, including royal weddings, and I think British royal women will be wearing it for such occasion for years to come.